Problem Interview is Ash Maurya's term for the interview you conduct to validate whether or not we have a real problem that our target audience has. 1. Problem - What are you solving? - How do customers rank the top 3 problems? 2. Existing Alternatives - Who is your competition? - How do customers solve these problems today? 3. Customer Segments - Who has the pain? - Is this a viable customer segment? Talking to people is hard, and talking to people in person is even harder. The best way to do this is building a script and sticking to it. Also don’t tweak your script until you’ve done enough interviews so that your responses are consistent. While you can conduct the interview any way you want, whether by person, by blog, by emailing, the main point is to collect the information that you will need to validate your problem. Also, the interview script is merely a suggestion. As long as you can get the answers with your own methods, do go ahead! You can use the space below to write up your script. The script below is a great interview example proposed by Ash Maurya. However, if you can still arrive with answers that can help you, feel free to conduct the interview in any way you'd like. - What are you doing for a living now? So, one of the biggest problems we have is that we start a lot of startups, and it's always quite frustrating to not be really able to keep track of our progress, or knowing what to do, and when to do them. We find that we spend a lot of time scavenging over the internet for the newest tricks, or growth hacking tricks. While we are seasoned entrepreneurs, we still prefer to have some kind of guidelines to keep us in check. 1. Do you feel a strong urge to want to start a company? 2. If you have not started a company, do you feel overwhelmed by the fact that you don't have a clue about how to start it? 3. If you have started a company, do you also feel helpless sometimes when you don't know the best way to build or grow your company? 1. What resources do you usually use to start your business? 2. What parts of starting up is most difficult for you? Or what topics? 3. What is the best way for you to learn? 4. While starting up, if there was a checklist that makes sure you do everything you can do to grow your company, would you be able to follow them step by step, or would you skip most of them and get to the part where you are having most difficulty with? We are almost done with our product, and I think we have a pretty awesome solution to help startups build and grow their business in an efficient manner. 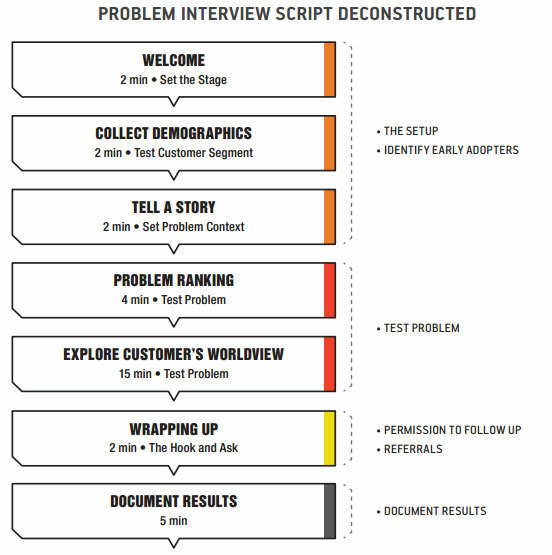 Please check out Ash Maurya’s Problem Interview Script Deconstructed from "Running Lean" for instructions on a more comprehensive interview strategy. If possible, you could also use emails or survey tools to get feedback as well.